We believe that pressing delicate vinyls is a craftsmanship which has to be build up out of first class equipment. 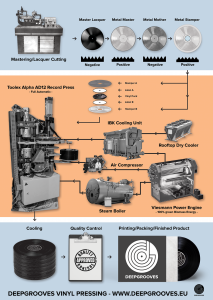 Steam, cooling and air compression are components which have to be steady and have to be used with utter care to deliver a consistent piece of music pressed on vinyl. Deepgrooves is pressing with brand new pressing equipment on Pheenix (Toolex) Alpha AD12 pressing machines, the legendary ‘Rolls Royce’ from well-made Swedish origin. Our steam boiler and cooling equipment is also brand new from excellent German quality. All the infrastructure we use is high-end and is being maintained with utter care to guarantee a high quality end-product. Just as we want to see it. Deepgrooves is the first vinyl pressing plant that is completely build upon 100% green bio-mass energy! Our complete energy supply to serve the steam, cooling and run our brand new Pheenix (Toolex) Alpha AD12 pressing machine is generated by two enormous Viessmann wood fired boilers. Future proof and sustainable to guarantee top notch quality and extended musical pleasure! The printing, cutting and mastering we are using is of outstanding quality and we think can’t be beaten. For further detailed questions please contact us. In case you have a special design request, our graphical design team can work out that specific wish you have. We will help you create that unique and powerful design you are looking for. Our team will help you in a creative and efficient way so your music gets wrapped in art! Please contact us to have an overview of what is possible! Mastering tracks is an essential and important part of music. Our in-house master engineer can make your music even more special by boosting it in the right direction. We can make your music more vivid and lively with that extra delicate touch. Mastering can be done analogue or hybrid and is done in one of the most spectacular studios in the north of the Netherlands. Analog tape and restoration is also an option. The music can even be mastered on that exact level where music on vinyl can reach an even higher, elevated point. Our General Terms and Conditions apply to all our orders.